We get a lot of letters here at the OWCN. Most of these letters are from school children and since I have started, I have made the effort to read every letter, since these kids have taken the time to write to us. Because these letters are from children, they are of course very charming, but they are also surprisingly insightful. I thought I would share some of the contents of these letters, so you can also enjoy them. The first things to note about the letters that come in from children, is they are very polite. I don’t think we have received a letter that doesn’t start with a thank you. They are also filled with compliments, such as these ones. The thank you notes and compliments are usually followed by some general observations. Many of the kids seem to genuinely care about the people involved and also have a lot of concern for the oil spill workers. Plus you probably are not even asked to do it or if you wanted to. – Kennedy referring to the cleaning of oiled animals. They also have lots of good suggestions, that maybe we hadn’t thought of. And lastly, they always want to know what they can do to help out. 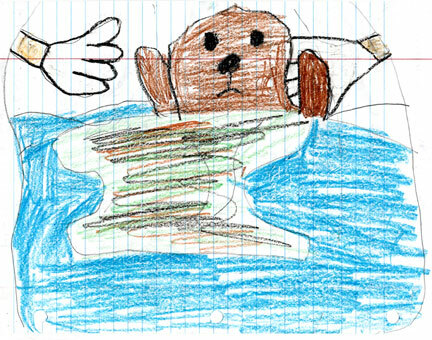 There are always a few kids in each batch of letters that make sure to let us know that they want to protect wildlife when they grow up (When I grow up I want to have a job just like you. – Vanessa). Hopefully many of them will decide to go into wildlife protection and conservation. And as a last note, thank you to all the staff and volunteers at all of the OWCN member organizations. Your hard work has not gone unnoticed by these children from all across the country, and you have clearly become role models for the next generation of wildlife care workers. Thursday dawned like any other day. But by the time most people got their morning coffee and made it to the office, there had already been a marked difference to this particular day. Sometime in the wee hours of Thursday, October 7, while most of us were still asleep, an oil tanker being hauled by a big rig suddenly came loose, resulting in a ruptured tank that spilled nearly 6,800 gallons of heavy-grade marine diesel in an industrial yard in Compton, just south of Los Angeles. Most of the diesel spilled onto pavement, although some of the product was able to reach a storm drain and a concrete channel near the source of the spill. The tanker belonged to Asbury Environmental Services, a company of about 450 trucks that transport waste oil and hazardous liquid materials around the state. Fortunately, cleanup began immediately, with 4,800 gallons recovered by nightfall. A diesel spill is like a double-edged sword. On the one hand, diesel evaporates quickly, especially in a warm environment such as Compton. On the other hand, if wildlife come into contact with diesel, it can cause severe burns, both externally and internally, such as in the nares and respiratory system from breathing the fumes, or in the digestive system if it is ingested. Because of this, it was important to get field operation teams to the scene as quickly as possible. By mid-morning, two highly trained personnel from International Bird Rescue Research Center (IBRRC) in San Pedro were scanning the area for affected wildlife. This team surveyed the entire location the rest of that day and on Friday, and only reported a few birds (mostly American Coots and a moorhen) that had a slight sheen on their feathers but could still fly. 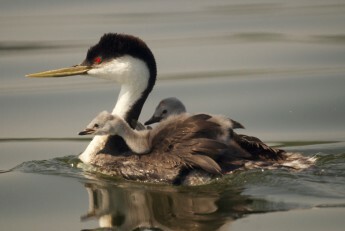 The presence of cleanup crews after oil or diesel spills often helps deter birds from the affected areas, and this appeared to also be the case during the cleanup of this spill, potentially lessening the number of wildlife that could have been impacted. No birds, dead or alive, were collected from this diesel spill thanks to the quick action of the cleanup crews and the field operations team. Once again, we dodged the bullet, and quoting the wise saying that is written on the Asbury Environmental Services website, “Protecting our environment today, so we will have one tomorrow”. This is a good motto for all of us to keep in mind. Next time we may not be so lucky. Oilapalooza went off beautifully this past weekend! A total of 164 network members attended the conference, representing a record 21 of our 29 network member organizations. This enormous showing created a wonderful sense of community among our group, which is usually scattered so wide across California and beyond! The conference opened bright and early Saturday with Member Updates, a new opportunity for a representative of each member organization to share their group’s activities and innovations of the past year. 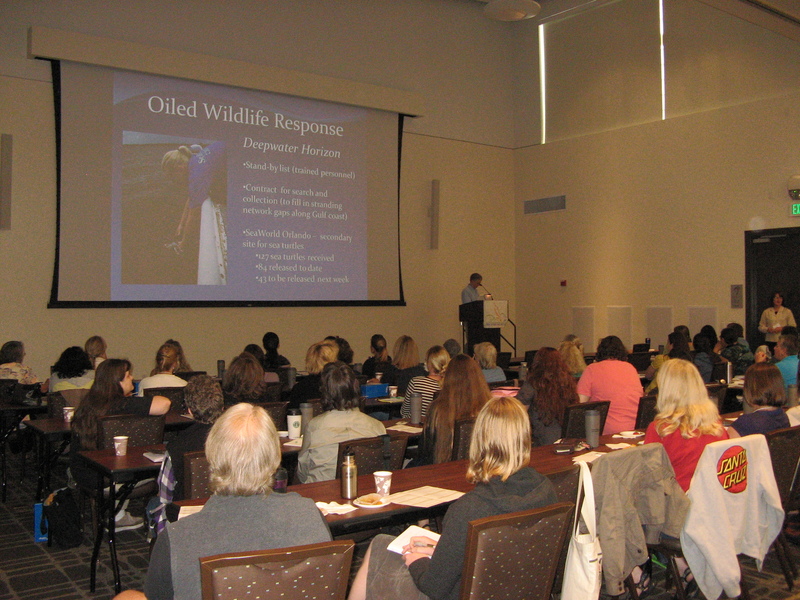 Over Saturday and Sunday there were a grand total of 21 lectures presented in 5 sessions: Oil Spill Basics, Stabilization & Supportive Care, Disease Updates, Post-Release Studies, and Research on the Cutting Edge. 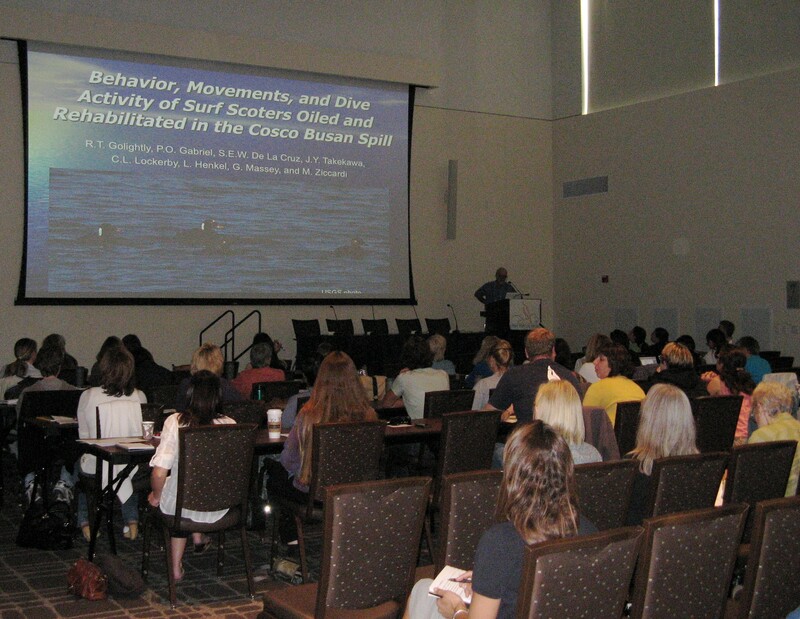 Rick Golightly of Humboldt State University presents research on surf scoter post-release behavior. Pam Yochem (at far right) of the Hubbs SeaWorld Research Institute speaks about response readiness during Member Updates. After lectures on Saturday, we enjoyed good food and good company while Drs. 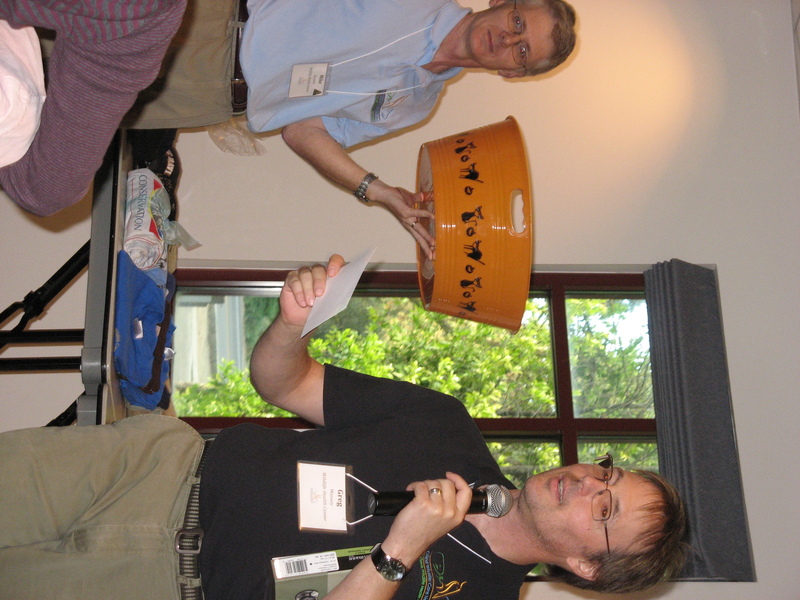 Mike and Greg raffled off prizes contributed by the member organizations. On Sunday, we closed the conference with a roundtable discussion of lessons learned in the Deepwater Horizon Spill response. The panel included six of the many responders from our network. Greg announces a raffle winner while "Vanna" looks on. 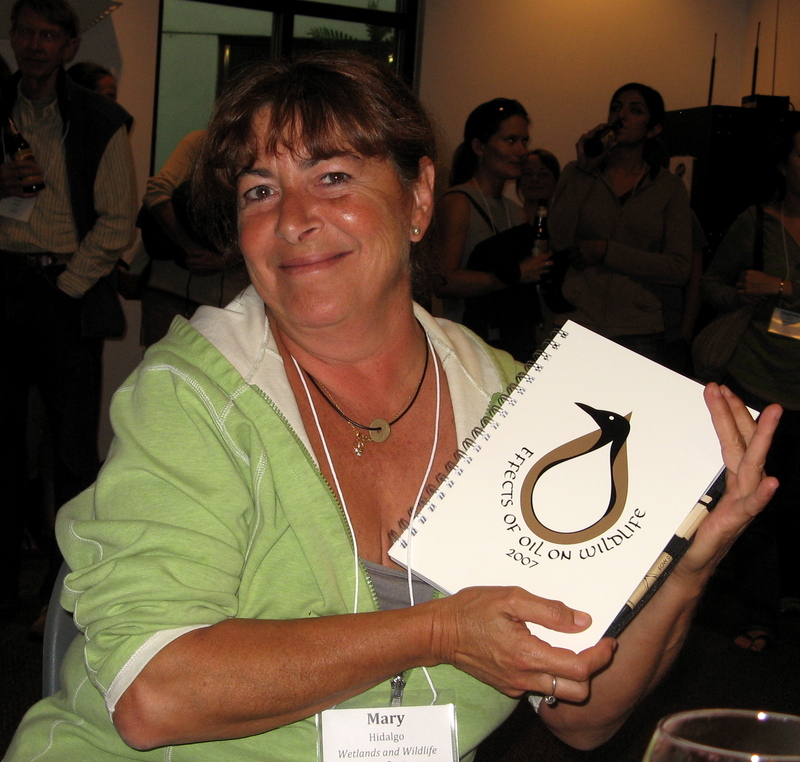 The 2011 conference is tentatively scheduled to take place in October in Southern California. And for those of you who missed the chance to get your hands (well, really, your PPE) wet in training labs, don’t worry; in 2011 we will return to the familiar format of lectures on Saturday and labs on Sunday. An enormous thank you to the presenters for sharing their knowledge and research. Another thank you to Chris and Lavonne in particular; the success of the conference this year is due to their amazing work over this past summer. And, most importantly, thanks to all of you who came to learn with us. As a brand new OWCN-er, it was a real pleasure to meet the people who make up this network and who make wildlife spill response a reality in California. I’m really looking forward to seeing everyone again next year! Mary Hidalgo of Wetlands and Wildlife Care Center shows off her raffle winnings. Hello everyone, this is Becky Elias, the new volunteer coordinator for OWCN. The welcome that I’ve received from the staff here at the OWCN has been great, and I already feel like I’ve been adopted into the most amazing of “work families”. Kyra and Emily have been great at showing me the ropes, even as they are learning themselves, and Kaiti was kind enough to leave a wealth of highly organized information to help me along. A little about myself, I was born and raised in Washington State and obtained my bachelors and masters at Washington State University (WSU). I did my masters work on reproduction and behavior of endangered Columbia Basin pygmy rabbits, and went on to manage the pygmy rabbit captive breeding program at WSU for an additional four years. My husband’s work took us to Michigan a few years ago, and at that time I became involved working for the Children’s Zoo in Saginaw, MI, as a zookeeper. Those cold Michigan winters (I didn’t even know that -15 was a possible temperature until I moved there!) and the distance from family made us decide to look toward coming back west. When I received the opportunity to work here at the OWCN, I jumped at the chance. So far everything has been more than I could have hoped for. I also got a chance to meet many people from the OWCN network this past weekend during Oilpalooza, which was very exciting. Now the only thing left, is awaiting the arrival of my husband and daughter, who are unfortunately staying in Michigan for a few more months. I have, however, been adapting to being a long-distance wife/mom, and I am getting good at fielding phone call questions (“Yes, you can wear sandals to school tomorrow, no, you cannot use printer paper if you run out of toilet paper, and Honey, please go buy toilet paper immediately!”). In the meantime, I will be enjoying my new work family and looking forward to digging into work! Everyone at OWCN is getting geared up for Oilapalooza 2010, our annual Rehabilitation & Research Conference that starts tomorrow. Thanks in large part to Herculean efforts by Lavonne, our amazing administrator, we are ready to go despite all the challenges of planning a conference during the craziness of Deepwater Horizon. We’re looking forward to a fantastic program, with 21 talks in 5 sessions, and we have over 160 people registered! We’ll also have a panel discussion on the Deepwater Horizon spill, which no doubt will be well-attended. Mike is back from the Gulf, at least temporarily, so we’re all going to enjoy having him around. Our goal is to have lots of learning going on in the midst of a fun time; ambitious, perhaps, but I’m sure we can pull it off! Stay tuned . . . next week we’ll let you know how it went and hopefully have some pictures of the festivities.